Nightmare x Groove Collaboration?! I have visiting dolls! 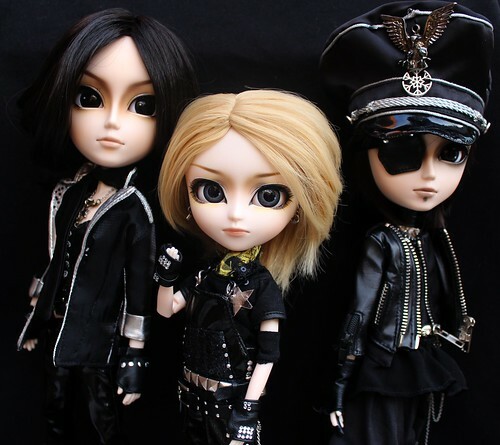 I recently blogged about how Groove had done a set of five dolls based upon the Japanese Visual Kei band Nightmare (which you can read here). Unfortunately, Groove only ever took one promotional photo of the set and it didn’t show all the boys off all that well, personally if I am going to spend several hundred dollars on a set of dolls I want lots of photos to help me make that decision. Pullipstyle was recently able to obtain a small number of the Nightmare set (they also have a small number of extra Yomi and Ni-ya that are available for purchase separately as of this writing). I was asked by Pullipstyle if I might like to have some visitors, as the visitors were just dying to have their photos taken. Taeyangs Ni-ya & Ruka as well as Isul Yomi were sent so I can take some photos of them. Please note I unfortunately do not have the other two dolls/band members or have access to them just these three. The trio are only here on loan to me, so they will only be here for a week or two. I intend to post up full reviews as well as tons of photos of all three of the boys before sending them to Pullipstyle. If anyone has any particular photo requests involving any of the trio please let me know as soon as possible and I will try to accommodate. Keep an eye on my flickr for photos. Special thanks to Pullipstyle for being super awesome and letting the dolls come for a visit! I promise to have more MIO review stuff up soon! Edit: The Nightmare Set has sold out on Pullipstyle but there are still a few Isul Yomi and Taeyang Ni-ya in stock, so act fast! This entry was posted in isul, Taeyang/ Namu and tagged isul, ni-ya, nightmare, nightmare band, ruka, taeyang, yomi. Bookmark the permalink.